The greater problem of playing old fashioned Metal genres is simple: the bands will, definitively, sound like the previous ones. It’s hard to be yourself when you’re living in the shadows of the past. An old band will always prevail because it’s doing what they did for so long, so how can a newcomer want to defy the titans? Can the readers conceive of a younger band playing in the same vein of CANNIBAL CORPSE overcoming them? It’s impossible. That’s what we can say about the experienced German quintet OBSCENITY: they’re experienced and can’t be beaten in their own game, as “Summoning the Circle” is here to prove. Their musical work is based in an Old School Death Metal format like bands as DEATH, MASSACRE, POSSESSED, BOLT THROWER and all those classical names from the beginning of the genre. It’s nothing new at all, but the band isn’t new either. And the way they play is really good, showing those aggressive elements with a brutal insight. No melodies, no exaggerated technique, just brutality, chaos and very grasping aggressive instrumental parts filled with guttural grunts. On the production of the album is the guarantee of a Death Metal album with an Old School approach, but not denying the use of modern techs on recording. Christoph Brandes (an experienced producer) mixed and mastered “Summoning the Circle”, creating a sonority that is brutal and aggressive, but in a way that they can be heard and understood clearly. Even the artwork creates the 90’s feeling. Nine tracks of aggressiveness made music await the fans. And “Used and Abused” with its sharp guitar riffs’ attack, “Feasting from the Dead” (that uses a very good balance between fast parts and slower moments, what shows a fine work from bass guitar and drums), the bitter slower tempos’ parts of “Dreadfully Embraced” (what great grunts are used on this song) and of “Scourge of Humanity” (this one has excellent guitars), and the sickening solos of “Invocation Obscure” (where some melodies can be heard clearly) are the best shots given by the quintet. 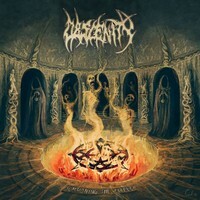 As written above: “Summoning the Circle” presents nothing that we haven’t heard before, but OBSCENITY work is really very good to be left aside.